All the latest information on my songs, appearances and causes close to my heart can be found here but please take the time to give me your views too. CD Sales. A request – Sales of the CD are going even better than I’d hoped. I’d thought that I’d sell most of them when I did my tour this year (look for announcements of dates and places nearer the time) but it looks like I’m going to have to order some more. So to all of you who have purchased a copy – a huge “Thank You!” However, I am now living in Sunny Spain and, as I am my own distribution network (I put the CDs into envelopes, address them and post them off), if you order through the Shop page here your CD may take a while to get to you if you are in the UK. The download version may not come in a spiffy cover but it can’t get lost down the back of the sofa or get scratched. On the minus side it can’t be recycled as a bird scarer in the same way a physical disc can. It is cheaper, of course, as I don’t have to pay any production or postage costs and you reap the benefit. You can even download single tracks (Why would you do that?). Anyway, for those of you wanting to get my music this way just click here. If you do download it could you do me a small favour and put a small review – or a large one if you feel like it – on the Amazon page? Thanks. A Local Legend – The description “legend” is bandied about a lot nowadays and it tends to devalue the really legendary figures. One such was Ann Glanville, a native of Saltash Waterside, who, finding herself with a sick husband and fourteen children to clothe and feed, picked up her waterman husbands oars and took his place. Despite the work – ferrying goods up and down the Tamar – being backbreaking she still somehow found time to lead a team of lady rowers that took on and beat the best of the local men’s teams. Legend has it that they even crossed the Channel to meet a team of French men. To find out how that panned out click here. Three Wise Men? – Phil Widdows, the man behind the superb Folkcast podcast, has Ken Nicol (ex-Steeleye Span and Albion Band member), Greg Hancock and me as the Three Wise Men of folk. Not sure about me but you can hear the others and more besides in June’s Folkcast podcast – still the best 60 minutes of folk, acoustic and singer/songwriter music anywhere on the interweb. Hear this podcast here. The song in question – The Song of Mister Happy has it´s own video here. A New Supergroup? – Maybe (but possibly not!) Over the weekend of the 28th/29th July 2018 I will be playing at the Riverfolk Festival. A lovely venue on the banks of the Thames outside Lechlade. I’ll be appearing with my old band – Group 4. Following our successful reunion in April (well – we didn’t get booed off) we’re doing it again at the festival. I’ve also got a solo spot but I’ll be doing it as a duo with the extremely talented Mike House as the newly formed Harding and House. I am currently in Spain writing and recording some new songs (and one that I co-wrote almost 50 years ago which has stood the test of time surprisingly well) and looking forward to making music with old friends again. Out of Hibernation – As I become less wobbly I am starting my planning for 2018.Currently writing and recording a few new songs in the sun but I’ll be returning in March and look forward to meeting up with old friends. April sees me in Shropshire at the reunion of my very first band – Group 4. See our innocent young faces here. Fifty years on and a few pounds heavier in my case. Should be fun. I have gigs lined up in Devon, Wales and Cumbria (not on the same day, luckily) and a festival and, and….as the dates get firmed up I’ll post them here. At the moment it’s a bit like making the pieces of a jigsaw come together. Quiet, Isn’t It? – No gigs, no new songs – what’s happening? Glad you asked. I’ve been having a few health issues. Imagine you’ve had several pints followed by several brandies followed by some shots. Imagine trying to walk in a straight line and veering wildly from side to side. That’s been me for the past couple of months with the annoying proviso that I don’t drink so I have all the side effects and none of the pleasure. I am now able to stand up unaided and am almost back to as normal as I ever get. The acid test is how long I can stand under the shower with my eyes closed without falling over backwards. When I have been in there under the water with my eyes closed so long I am as wrinkled as an elephant’s scrotum I will know I am fully recovered. Approaching maximum wrinkle now (including a few that I enter the shower with) so hopefully I will maintain this happy state. Andy Goes Country! – I try desperately not to categorise my music (except it definitely isn’t Rap!) and I’ve been on Doug Parish’s Classic Country before. He has a broad definition of “Country” and I seem to fit within his definition so who am I to argue? Doug is a nice man who hosts the show with Marjorie, his wife and both are real enthusiasts and champions of local (or “localish” in my case) musicians. I was on the show a while back and did a chat and three songs live and I’m hoping to do the same some time next year. You can listen to the show which “Troubadour” was on by clicking here. My bit is around 42 minutes (strange how I seem to be positioned at around the 40 minute mark on most radio programmes!) but the whole show is great and is a real mix. Doug’s show goes out on two other stations so that’s actually three radio plays for the price of one. Happy days. I Want To Tell You a Story – I was asked to record “The Story Behind the Song” for Folkcast 136. If you don’t have time to listen to the whole show (and you should – it’s brilliant!) you can hear the story behind “Little Pierce of Tin” here. Misheard or not, the song was played on Mike Davies’ Alternative Roots last Sunday. A great two hours of music and I find myself in the company of Cat Stevens and Neil Young (they must be so proud!). Skip to a point around 42 minutes in to hear my bit but you’d be missing a lot of good music if that’s all you heard. Mike is becoming a bit of a hero of mine. He played Tuesday Night Troubadour, he is the only programme to play The Song of Mister Happy and now he goes for the hat trick with “Charlie”. Bless his amazing good taste! Shock – horror!! – I got a reply from one radio station (that shall be nameless) saying that they would be playing several tracks from the new CD but went on to add the rider (quote) “but not, obviously, The Song of Mister Happy”. It was that “obviously” that had me puzzled. Who are they scared of offending? The fundamentalist Christians? The fundamentalist Moslems? The fundamentalist Jews? (Have you noticed that the word “mental” appears in all these descriptions?) But one brave programme host has made a stand and played it. Now I’m hoping that thousands of people complain, write to the papers, give interviews to the BBC and, if I’m really lucky, some bearded bloke will issue a fatwah. Well, it didn’t do Salman Rushdie’s sales any harm did it. All hail Mike Davies and Brum Radio. The offensive song can be found after 1 hour and 40 minutes although the whole show is excellent. Listen and be disgusted/appalled/shocked/saddened (delete as appropriate) here. Wot – No Gigs? – Ever heard of vasculitis? Nope, me neither until this week but it seems that this is probably the cause of several of my woes lately. The chief embuggerence at the moment is that I have a permanently blocked nose and sound like Melvyn Bragg’s more adenoidal brother. Anyway, it means I can’t sing anything containing the letters “m” or “n”. So that’s “Bides ob de Taybar” off the set list then. Hopefully I start treatment this week and I am assured that the air will soon be whistling back down my nostrils again soon. Almost there – All songs recorded and mixed, CD packaging designed. Now it’s into the hands of the estimable Jeff Boxall for mastering then off for duplication, printing and packaging. 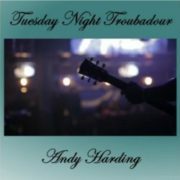 Here’s a look at the cover art for Tuesday Night Troubadour – on sale soon at gigs and here on the website. STOP PRESS -THE CD IS NOW AVAILABLE TO ORDER – it is at the duplicating plant and will be ready very soon – just click on the picture below to pre-order. You can even hear tasters of the tracks. Thank you Sweden! Latest sales figures for my music just in. They gave us Abba, they gave us the Volvo and now (drumroll) the Swedes are the people who have streamed my songs more than anyone else – except, of course, for my loyal British fan. The Swedes are, evidently, especially keen on pickled herrings and Little Piece of Tin. Also a big “thank you” to the three Brazilians who streamed Prince of the Waltzer. This vote of confidence from South America brought me a whole 3p in royalties. Off to shop for the Lear Jet tomorrow. The CD gets nearer! Two more songs almost finished and on their way to being committed to disc. The first, Little Piece of Tin is one from the Storytelling EP but re-recorded and polished. One of my heroes, Harvey Andrews, has said how much he likes this song – there can be no higher praise in my world. It’s a true story with a bitter-sweet ending. Another Great Unplugged – A magic evening. So much talent, such a lovely audience. You had to be there to really appreciate how good it was but you can some photos from the night here. In Great Company – Fairport Convention, Martin Carthy, Steeleye Span, Geoff Lakeman…….and me!! All together on the March 2017 edition of Folkcast, the UK’s premier podcast for folk, folk-rock, singer-songwriter and roots music. This month it features Mines of the Tamar so you get not just me but Wenna Millership on fiddle and penny whistle and Graham Mansbridge on bass as well as most of the Edgson family as the “choir”. Hear it here. No Comment?? – I’ve removed the “Comments” boxes from the site. Not because I don’t want your comments – I live for praise and compliments (I ignore the other sort of comment) – but because I was getting at least ten emails a day trying to sell me Viagra, interest me in stunning Russian ladies looking for love or, even more annoyingly, talking to me in Chinese. Got something to say? Please use the email section on the “Contact” page. An Indian Summer – I’ve been approached to write lyrics for a new musical about a famous Indian (no – not Ghandi – the type that wears moccasins). Early days but an interesting project. The musical already exists and has been performed in schools in a short form but the idea is to expand it to a full length production. I already have a rhyme for the main character….”spot of bother”. Any guesses as to his identity? Mines, Canals and Tunnels – Out of the blue comes an email asking if my song “Mines of the Tamar” can be used in a project by a local artist. Laura Hope produces interesting work based on the local landscape and her next project will revolve around the Tavistock to Morwellham canal. Very early days and still at the planning and research stage but it looks an exciting piece of work to be involved in. That’s two projects in as many weeks that will involve Arts Council funding. I can see my interview with Melvyn Bragg on the horizon! Evidently, according to the figures, the Brits prefer to buy my music as a download of the entire 3 track EP while the Canadians are more cautious and download individual songs. The rest of the world prefers to stream the songs, mainly through Spotify. We Brits don’t seem to have caught on to this so far (well, not as far as my music is concerned) and downloads far outnumber streams. Guess how much I earned from the Beats store? One whole penny! Methinks Beats are ripping the average musician off. Seems the Brits prefer to buy my music through Amazon whereas the Canadians buy through iTunes. Well done fellow Britons – Amazon pays me the most per purchase too. The power of the internet is also evident. Most music seems to be streamed nowadays. Bad news for your struggling muso as the amounts paid per single play are pitiful but it does mean that my music has been heard in Russia, Brazil, Malaysia and Peru. What the average Peruvian, tending his llamas on Machu Pichu makes of a song about a fairground ride on Plymouth Hoe we can only surmise but the llama herder must have liked it because he listened to it several times (unless there is a secret “Andy Harding Appreciation Society – Peruvian Chapter” and there are three of them adding me to their playlists). Like so many British artists before me (Cliff Richard, for example) I have yet to “break” America. Mind you, I bet Cliff sold more than five tracks to the Yanks over a year. I am planning a tour next year and, if my international sales keep up this trend, I will be criss-crossing the world. Mind you, when you know that sales in Russia amount to 2 tracks at (after iTunes take their cut) 14p a time I think we’ll need to increase volumes a bit to pay the air fares. The limo and the country estate are also on hold at the moment. I am, however, planning to go for a curry with my earnings. Just occurred to me – every Saturday there used to be a group of South American musicians outside Woolworths in Plymouth . Ponchos, felt hats, small guitars, pan pipes. Then Woolworths closed down and they disappeared. Maybe they went back to Peru. Maybe they missed Plymouth and searched the internet for songs about their adopted city. Maybe, just maybe, they came across a song about a love affair on Plymouth Hoe and, high on an Andean peak, they logged onto Spotify. Maybe, outside whatever the equivalent of Woolworths is in Peru, there is a group of minstrels playing “Prince of the Walzer” on pan pipes and feeling nostalgic for Devon. Or maybe not. Leaving the Sound – The latest song written during my Spanish excursion. I’ve had this song in mind for ages but struggled with the tune. Then, having got the tune, I agonised over the arrangement. Thanks to Angy’s advice (“Stop faffing* about and decide on one version!”) I finally got it done. Read the background and listen to “Leaving the Sound” here. I will soon be following the swallows South and I have a folder full of songs that need finishing – some lyrics that need tunes, some tunes awaiting lyrics etc. Could be a busy 4 months at Vino Collapso Studios. I am investigating costs of having CDs pressed. Watch this space. Amazing the power of the internet. Just heard that “Refugees” (my song from the ” For Syria With Love” CD) has been played on Cuillan FM – the radio station for Skye and Lochailsh. That would explain the increased number of hits on my website last week! Evidently they play an eclectic mix of music – Refugees was played between Jimi Hendrix and Fairport Convention. Should you wish to see what else Radio Cuillin has to offer you can find the station here. It’s here! Now available as a digital download, the collection of 10 songs contributed by myself and nine other artists is available at Bandcamp and Amazon. It will also soon be available as a physical CD. There cannot be a better cause. Every penny raised by this project goes to help Syrian refugees – either in camps in the Lebanon or still trapped in the hell of Aleppo. Remember than picture of the dazed, bemused and bloodied toddler pulled from the rubble after bombing? Well this is to make the lives of kids like him better. To provide desperate people in refugee camps with water, shoes, food parcels etc. To bring a little comfort to those in desperate need who have been driven from their homes with little more than the clothes on their backs. A minimum of £7-50 for the download and (as physical CDs are costly to produce) a minimum donation of £10 if you want the music in that form. You get a beautiful collection of music and a warm glow from helping fellow human beings in their time of despair. Please email me if you want the CD. Busy performing here and there but a special mention of the latest “Penny Unplugged” is in order. It just shows that it is possible, in a reasonable sized room, to perform to more than 50 people with no mics, no amps – no sound reinforcement at all. All you need is an audience that wants to listen. Anyway, a great night. Oh what a night! Saw Steve Knightley in a sort of “an audience with” on Monday (9th May) night. A mix of chat and songs as he gave his musical life story and his thoughts on songwriting and played some of his songs. A magical night and a fascinating insight into how the Show of Hands “cottage industry” style of music works. No fee (a percentage of the door instead) except for festivals and his thoughts on how big an audience they can attract (about 550 for a “normal” gig if you’re interested). All music should work this way and all musicians should be so talented. Yet another Penny Unplugged on Sunday 15th. Always a great night and there are already some great local artistes lined up. The distractions of sunshine, beaches, cheap tapas and wine rather distracted me from recording all the new songs I’ve written. Another three new ones in the pipeline but I did manage to record this one. My Mum died at the end of 2015 – just short of her 90th birthday. Her final year was spent mainly in her own world. Here’s my song for her – hard to write,even harder to sing. I suspect I won’t be able to perform it live but here it is anyway. Yes I know – it should be “Memory’s Traces”. I spotted the typo too late to correct it on Soundcloud. Please ignore the guitar solo – it’s a sketch of what I want until a proper guitarist (Hi Mike!) gets their hands on it. Fame at last! 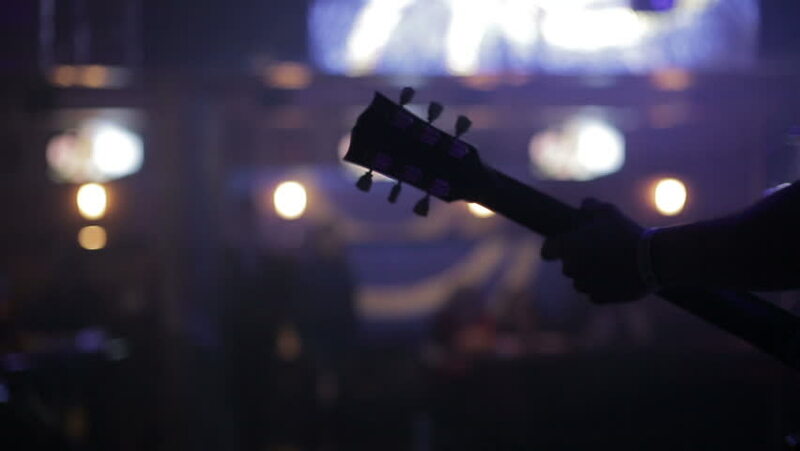 The October 2015 edition of Britain’s favourite podcast for Acoustic, Folk, folk-rock and singer-songwriter music – Folkcast – features “Tuesday Night Troubadour”. On the same bill as John Renbourne? Can’t be bad can it? The link is here. Even more national exposure! (Must cut down on the exclamation marks – a sure sign of hysteria!!!) What do Show of Hands, The Jackson 5, Bruce Springsteen and your humble singer/songwriter have in common? They all appear on December’s Folkcast. In October it was “Tuesday Night Troubadour” and this month it’s “Prince of the Waltzer”. To appear on the nation’s favourite acoustic music podcast once in a year is an honour. Twice is just amazing. Thanks to “Folky Phil Widdows” – obviously a man of impeccable taste. Evidently “Prince of the Waltzer” is a song of unrequited love. I thought it was requited but if Phil wants to read that into the lyrics, as long as he plays my songs who cares? Requited? Unrequited? Make up your own mind here. The third “Penny Unplugged” on 20th September. I always agonise over how many performers will turn up. Will there be an audience? As usual, I needn’t have worried. We met some new talented people and welcomed back some old friends. The place was packed and the audience listened beautifully and even harmonised occasionally. The next will be in the Spring of 2016. A riotous afternoon on August 16th when my occasional band The Dodgy Jammers headlined the Dragonfest Festival. Not the biggest crowd we’ve ever played to but certainly one of the most appreciative. We had a ball and so did the audience. Nigel Wayne brought his sax but never got the chance to play as I didn’t do “Charlie”. He was playing some jazz stuff beforehand so I think he forgave me. The Green Dragon at Northlew is always fun with a lovely audience. Graham and Wenna also helped my out by backing me on Tuesday Night Troubadour which is going down well. 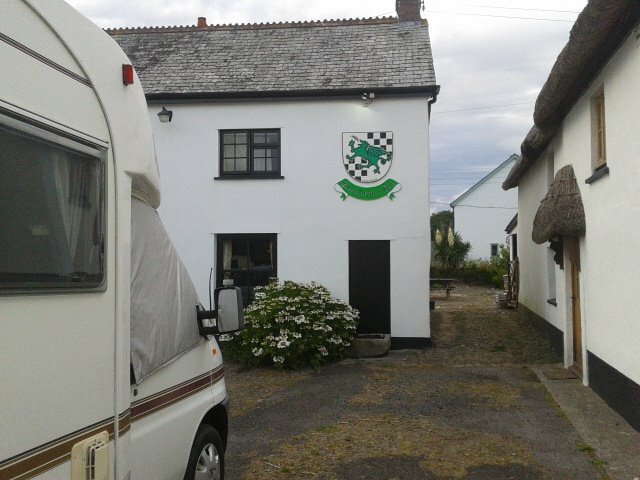 A new venue (for me) was the Kings Arms at South Zeal. Lovely pub with space for the “Tour Bus” out the back. Wenna did her stuff on “Troubadour” but Graham wimped out of transporting his double bass all that way. A night at a new venue for me – Honicombe Manor – on July 28th. Did mainly funny songs (everyone loves a song about a pasty) but for the first time sang Tuesday Night Troubadour on a Tuesday – while some guy played on the bandit! The irony seemed to be lost on him. I have recently started to review electro acoustic guitars that I have used over my many years of playing. If you would like to learn more read my review of Epiphone PR-5E acoustic guitar.